The fourteenth movies in the series, The Lost Ship in the Sky, will be released on April 17, 2010. In the film's story, Kid has his eyes set on the "Lady of the Sky" jewel aboard Bell 3, the largest airship in the world. 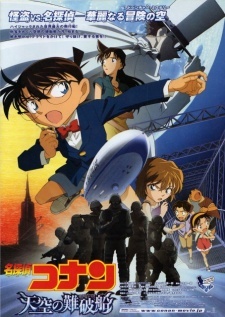 However, a mysterious terrorist gorup called Red Shamu-neko [Red Siamese Cat] has hijacked the airship itself, along with Conan and his allies Kogoro and Ran.